9 "Day of the Fallen"
Glenn Scott was a Labor Rep. at National Nurses United/National Nurses Organizing Committee. She died of cancer circa October 2018. In 1981 Glenn Scott, Chair of the Commission led a workshop entitled Anti-Racist Commission at the 10th Convention of the New American Movement. The convention was held in a union headquarters in Chicago and ran from July 29 - August 2, 1981. Scott spoke alongside Rose Brewer; Brenda Eichelberger, National Alliance of Black Feminists and Bob Niemann, LA NAM on a mini-plenary entitled Racism and Reaganism. Scott also spoke alongside Mike Rotkin, Santa Cruz NAM; Steve Tarzynski, Chair, Health Commission and Randy Cunningham, Chair, Urban Commission led a workshop entitled Pieces of State Power: Urban Electoral Coalitions. In 1980 Glenn Scott, Austin Texas, was a delegate to the December 12-14 Chicago, National Council meeting of the New American Movement. Between 1980 and 1981 Glenn Scott, Texas was the chair of the Racism Commission of the New American Movement. Bill Barclay (PC), Laura Berg (Portland NAM), Holly Graff (PC), John Haer (Pittsburgh NAM), Rick Kunnes (PC), Halli Lehrer (Chicago Northside NAM), Christine Riddiough (Blazing Star NAM), Glenn Scott (Austin NAM), and Steve Tarzynski (Los Angelos NAM), Robert Shaffer (New York NAM). On Sunday, June 7, 1981, the Los Angeles Chapter of the New American Movement sponsored a Tribute to Ben Dobbs for "His lifelong commitment to socialism". The event was held at the Miramar-Sheraton Hotel, Santa Monica, California. Sponsors of the event included Glenn Scott. Glenn Scott New American Movement was a moderator of the day one "Unity Session" of the Democratic Socialist Organizing Committee/New American Movement Unity Conference in Detroit March 21/22 1982, that resulted in the formation of Democratic Socialists of America. In 1985, Jan Breidenbach, Angie Fa, Nancy Kleniewski, Josephine Martinez, Lillie McLaughlin, Penny Schantz and Glenn Scott of Texas were listed on the National Executive of the Feminist Commission of the Democratic Socialists of America. “Texas does not have to be the state with the highest death rate nor with the highest rate of injuries in construction. The legislature can turn this around by adopting our legislative agenda for better safety and health for the workers who build Texas. That is why we are here today,” Worker’s Defense Project Executive Director Cristina Tsintzun said at a rally on February 25, 2015. 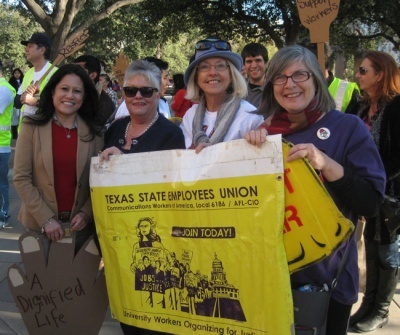 Among them were Monserrat Garibay (Education Austin), Becky Moeller (President, Texas AFL-CIO), The Rag Blog‘s Glenn Scott (retired National Nurses United organizer) and Alice Embree (Texas State Employees Union). We had a terrific event on Saturday. We have put Austin TARA on the Austin/Central Texas political and advocacy map! Over 147 people attended the event which means we met our goal of 150! In part due to Congressman Doggett's great reputation, we brought in many new faces. We went well beyond the TARA contact list for this event. We built stronger ties with labor groups through this event. At least 8 unions or CLC and Building trades council contributed $. One key to turnout was our list of over 30 endorsing organizations. Most of the endorsing organizations sent at least 1 or 2 and some brought as many as 8 to 10. Austin DSA got 10 members there and TSEU brought the most with at least 12 or more. Congressman Doggett's staff was another factor, - they did a letter to constituents and sent emails and did press for us in addition to our own efforts. The list of people who contributed memories and experience to the Austin Beloved Community website included Glenn Scott, union rep, National Nurses United. The Austin Texas Alliance for Retired Americans chapter met June 20, 2015? to finalize the plans for their Medicare 50th Birthday Celebration on July 25, plus discussed a possible fall fundraiser and ways to increase membership. Attending were Austin President Glenn Scott, TARA Secretary Tony Padilla, Austin Secretary-Treasurer Teresa Perez-Wiseley, Texas AFL-CIO Director/TARA Liaison Lee Forbes and Committee members Marie Drummond, Danny Fetonte and Yolanda Delgado. Austin Democratic Socialists of America shared Thorne Dreyer's post. April 8 2016. Thomas Grace is also speaking tonight at the TSEU Union Hall at 7pm, located at 1700 S. 1st St.
Tracey Schulz, Alice Embree, Cecilia Colome, Glenn Scott, Barbara Fetonte, Ron Nelson, Yolanda Delgado, Roger Baker, Jr. David Hamilton, Beverly Baker Moore. Glenn Scott was chosen as an Austin Democratic Socialists of America delegate to the Democratic Socialists of America National convention in Chicago, August 3-6, 2017. Glenn Scott supported the Democratic Socialists of America Unity grouping, established for the 2017 Democratic Socialists of America National Convention in Chicago. With Derrick Crowe and fellow DSA members Mickey Fetonte, Brett Cotham & Susan Cotham, Courtney Szigetvari, Linda Kniolek & Glenn Scott, fighting Trumpcare ONE MORE time and we beat 'em for now! Let's starting talking healthcare for ALL!! Thank you Bernie for introducing Medicare for All . Let's get to work educating people - we don't have to have a healthcare crisis! — with Susan Cotham, Courtney Alexa, Linda Kniolek and Derrick Crowe. New leadership for Austin Democratic Socialists of America, November 2017. Members of the Left Up To US closed Facebook group, as of August 11, 2017 included Glenn Scott. On April 1 2018, Glenn Scott was a member of the Texas DSA - Red State Rising closed Facebook group. DSA members beat the heat in Atx at july 29 Our Lives On the Line rally and march to stop Trumpcare ! Front row, Danny Saenz & David Wittie,(back row) David Pinkham , Ryan Rosshirt , Robin Hofpauer, Chau Lan Ngo, Monica Olvera , Cynthia Mancha, James Cole, Courtney Szigetvari, Roy Woody, Glenn Scott, Linda Kniolek & Akhil Mulgonaert. In 2018 Glenn Scott was an original signatory of the DSA North Star founding principles statement. Signatories also included non Boston comrades such as Glenn Scott. ↑ TARA FB pic June 20 2015? This page was last modified on 24 February 2019, at 04:58.